I would never call myself a cook. I can make a few things with reasonable proficiency (scrambled eggs and my mom’s chicken and dumplings top the list), but for the most part our dinners come from a box or follow an extremely easy recipe. 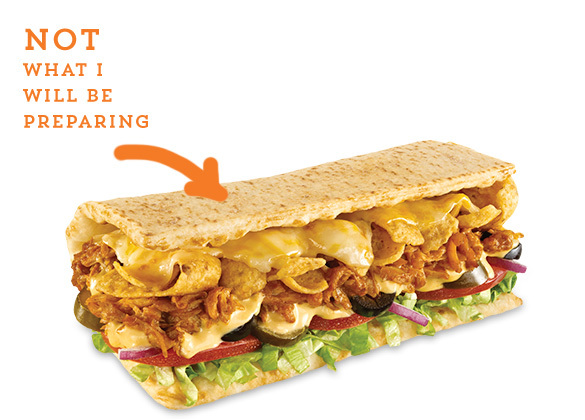 On TV a few weeks ago, I saw a sandwich that has haunted my dreams – the Fritos Chicken Enchilada Melt. But there was something wrong. Because putting my Frito pie on a sandwich is just not how I roll. I mean, imagine how tasty those Fritos and that cheese would be without the the pesky vegetables and bread getting in the way? And so I present, The Lazy Chef (hint: that’s me) and her Frito Chicken Enchilada Pie. To truly be a lazy chef, you have to insist on prepared foods. No from-scratch cooking for me, friends! 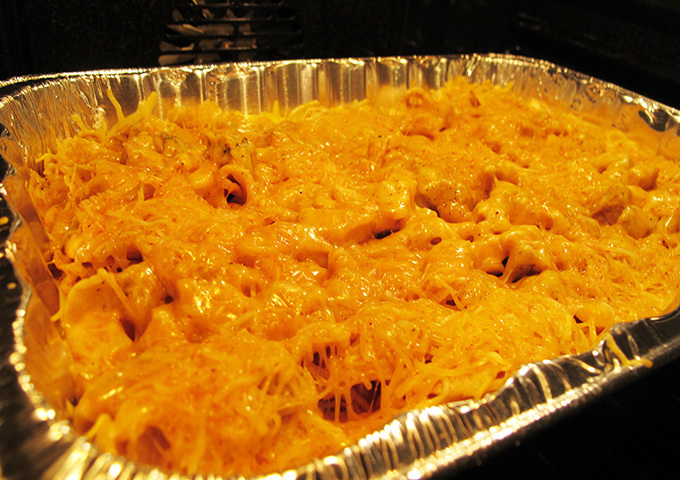 This pie only has four ingredients – Fritos, enchilada sauce, shredded cheese, and pre-cooked chicken. 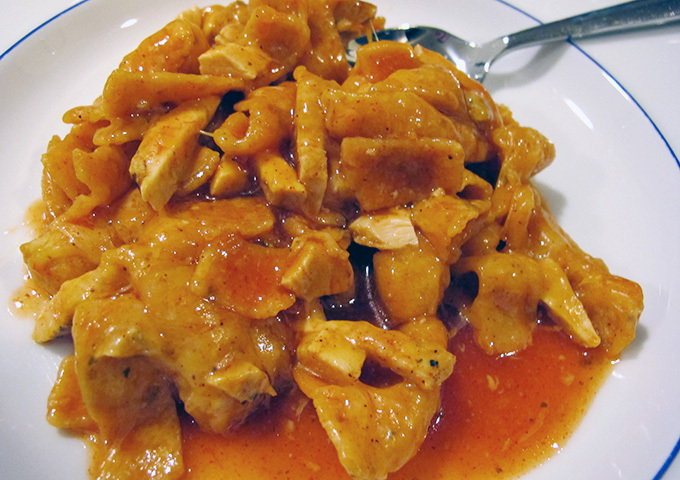 We only ended up using one bag of chicken, but you might want your pie a little meatier. But I went with pre-seasoned strips to add some more flavor, and I also opted for the “taco blend” cheese because there’s seasonings in there that aren’t in a plain ol’ cheese blend. Lazy! You’ll also notice I used a disposable metal pan for the pie instead of something from my kitchen. I’m telling you – I’m lazy. Disposable pan means clean-up is a breeze! 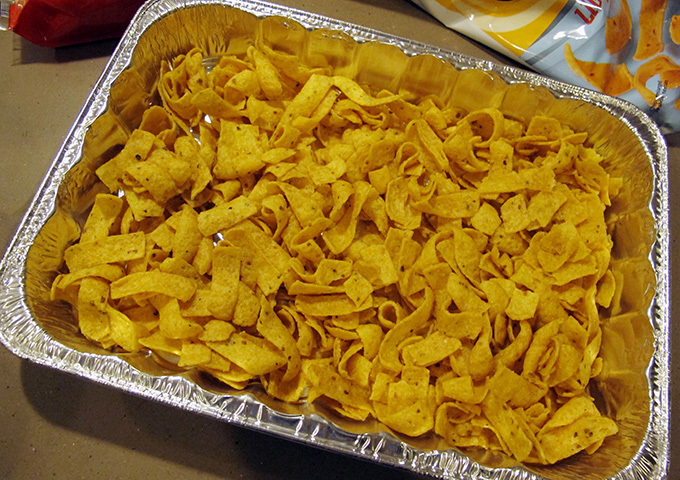 To start, dump out your bag of Fritos and spread them to make an even layer in the bottom of the pan. Oh, and preheat your oven to 350 degrees; you’ll need it in a minute. 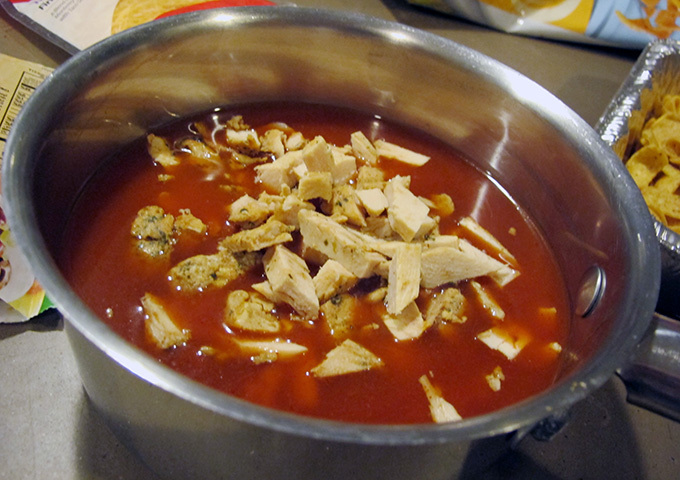 I wanted to make sure each bite had chicken-y goodness in it, so I cut and shredded my larger strips of chicken before adding them to the enchilada sauce. Now, here’s where I abandoned my lazy ways a bit. May I forever be cursed! 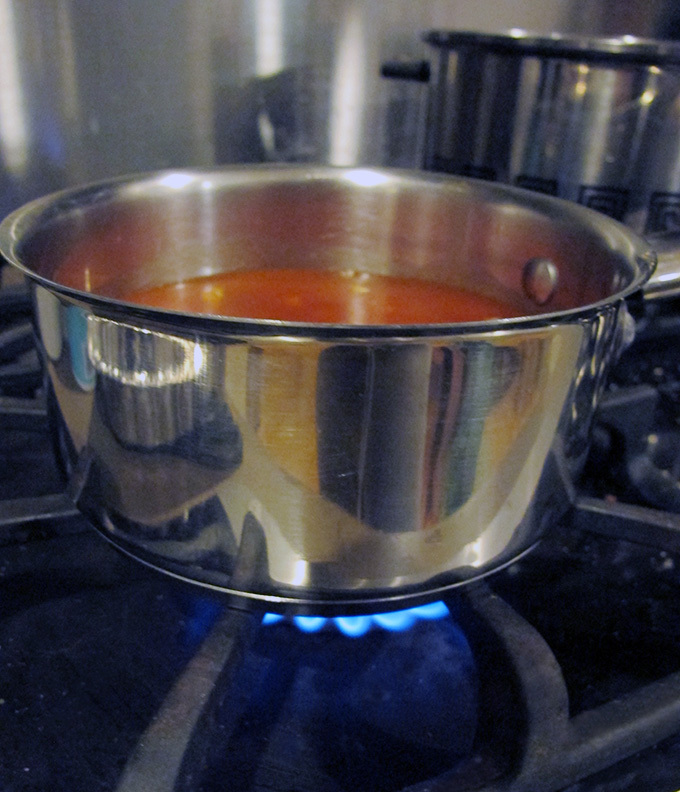 I have bad luck with things exploding in the microwave, so I chose to heat up my chicken and enchilada sauce on the stove rather than a quicker, more lazy method. You don’t need the enchilada sauce to be super hot – just nice and warm (and since the chicken is already cooked, no worries there). For me, that meant 5-10 minutes over medium heat. 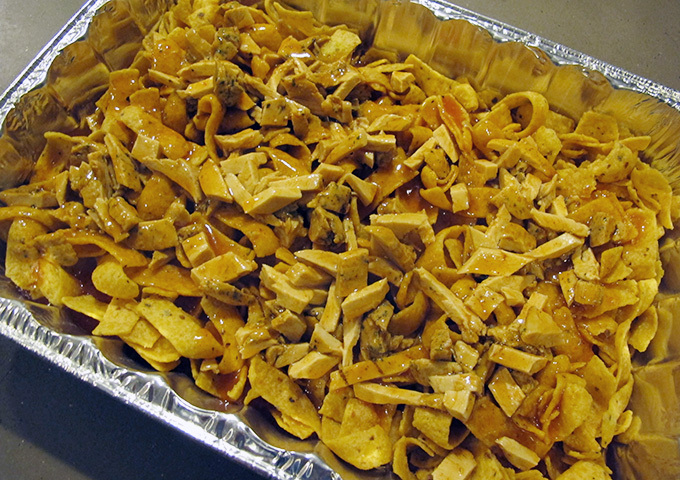 Once the sauce is heated up, pour the mixture over your bed of Fritos. 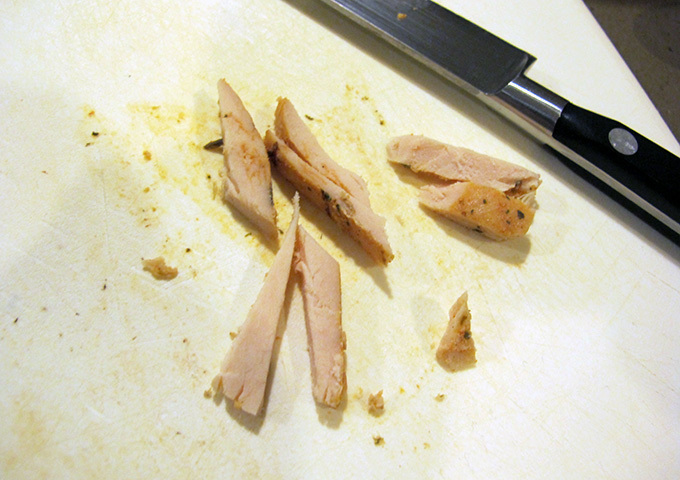 Our sauce, as you can see, was a bit thin. You can thicken the sauce by actually boiling it down, or you could add some flour as you heat it to “beef” it up. 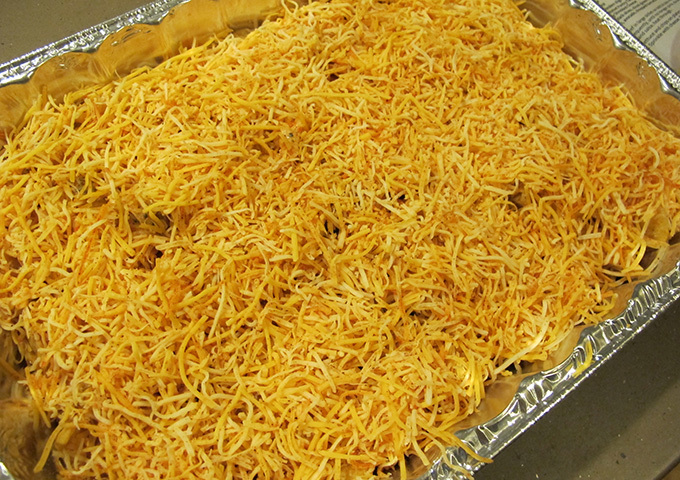 Next, evenly sprinkle your shredded cheese over the whole mess, making sure things are even. A cheese-less bite is just as bad as a bite of nothing but cheese. And the last step – popping your pan into the preheated oven. Bake the pie just long enough to get the cheese good and melty. 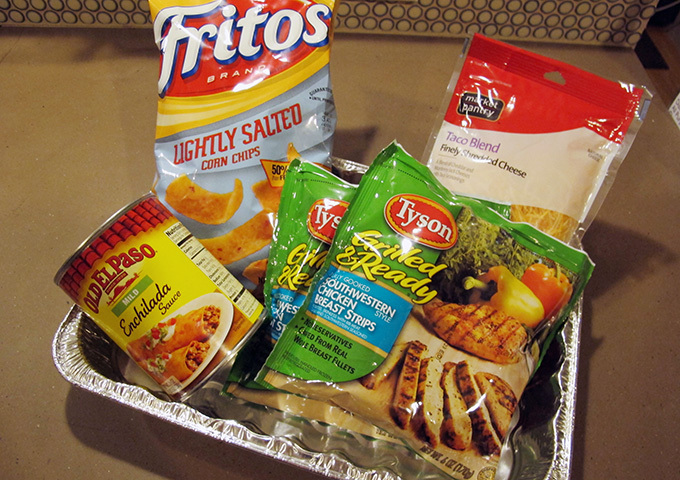 Fifteen minutes (tops) and I’ve got a Frito-licious meal that does away with Subway’s extraneous bread and veggies. And Jason has declared it more tasty than regular ol’ Frito pie with chili. 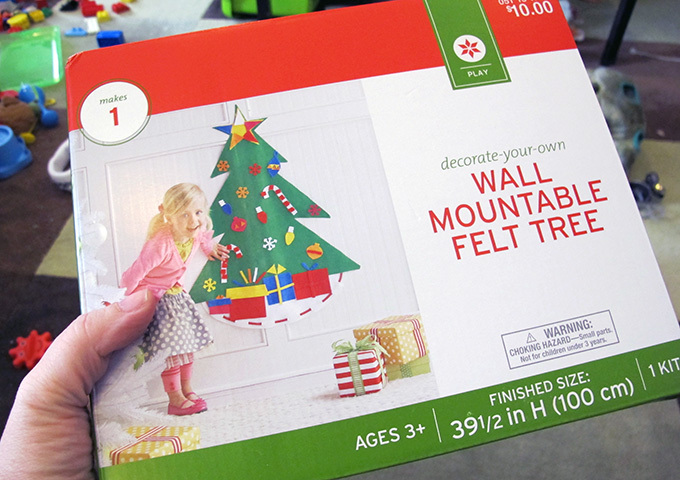 Want to get even lazier? Swing by your favorite Mexican restaurant and pick up a pint of green or red chili. 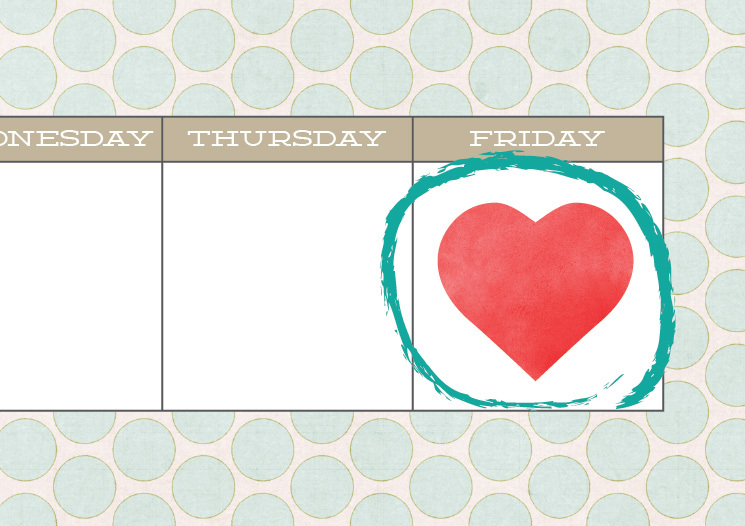 You can get that prep and cooking time down to five minutes or less! Enjoy!